No matter how familiar the Christmas story, it continues to fascinate us, inspire us and force us to rethink the great fact of the Incarnation. These messages are intended to help us probe behind these accounts to see their deeper meaning, and to renew our commitment to worship the Christ who was born as a baby. 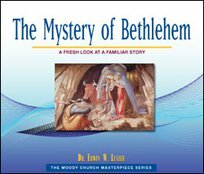 As you will learn, in the Mystery of Bethlehem lies our own salvation, and our hope for a future in which the Christ Child returns as a reigning King.